A magnitude powerful 6.7 earthquake hit the coast of north-central Chile on Saturday evening, the U.S. Geological Survey said, and witnesses said it rattled buildings farther south in the capital city of Santiago but left only minor damage in its wake. 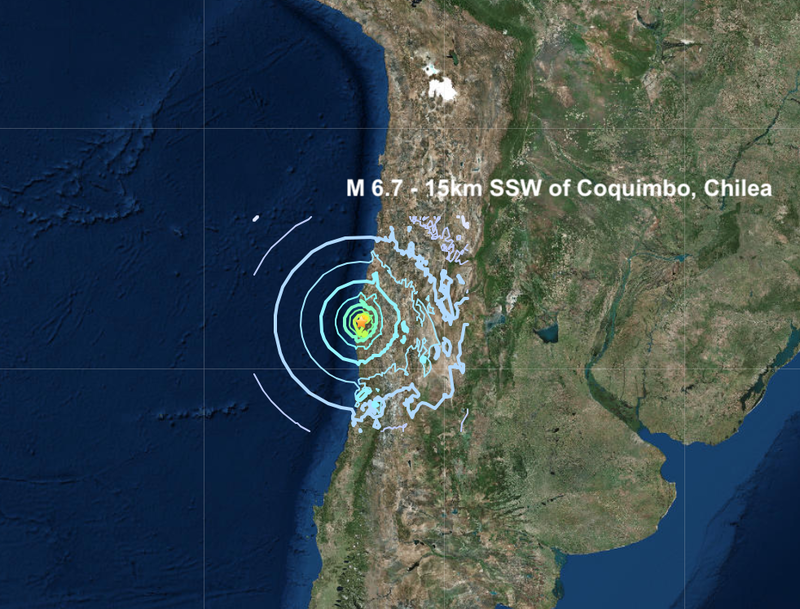 The quake struck at 10:32 p.m. local time (0132 GMT) about 15.6 km (9.7 miles) south-southwest of Coquimbo, the USGS said. The quake was 53 km (33 miles) below the surface, a relatively shallow tremor (which are much more powerful than deep quakes) that shook homes and had some worried about a possible tsunami. The Pacific Tsunami Warning Center, however, quickly discarded a tsunami threat following the tremor. The quake was the 3rd major quake of this week and the 8th of a busy January.